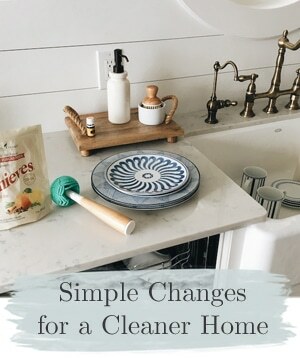 I‘m really excited to complete a few simple weekend makeovers this summer! 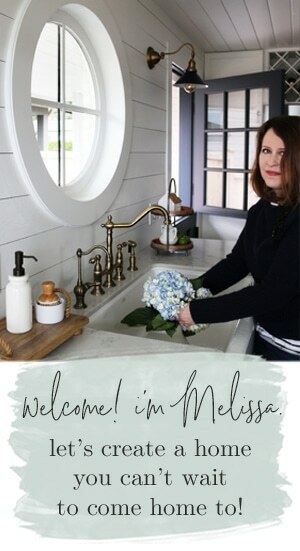 Especially makeovers inspired by my desire to create meaningful and memorable family spaces for enjoying summer evenings! This holiday weekend we got to fulfill a long time dream, a backyard fire pit for family nights! YAHOO! We had kind of a sad, lonely place for a fire pit though, with no landscaping whatsoever (unless you count the weeds, which I think should totally count as landscaping). It was not very inspiring, so it was time to get to work! We had just a couple of hours to make this space fit for an informal party of “s’mores and fireworks” on the 4th of July. What do you need for a backyard oasis? 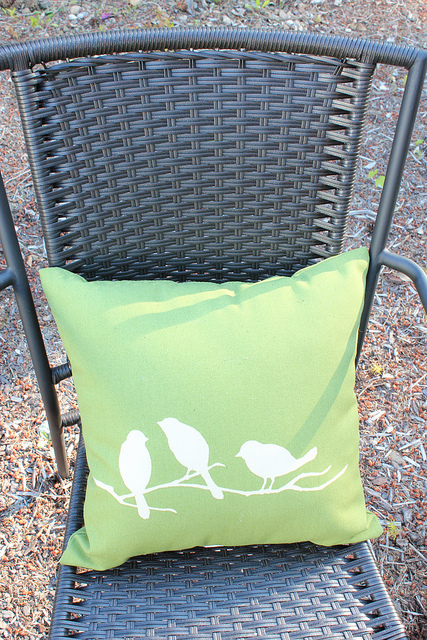 A cute outdoor pillow or two. Outdoor chairs for sitting around the fire. 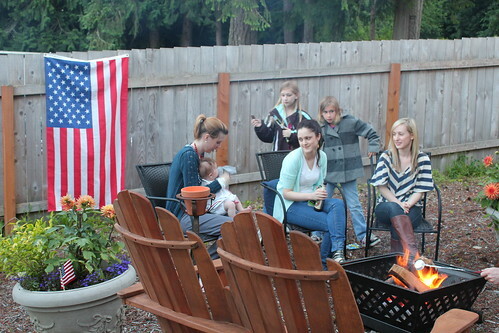 A flag, a few planters with summer flowers, a roaring fire in the new fire pit and all the ingredients for s’mores! Well, and about 25 friends to celebrate with you. There is obviously more we can do to this space down the road, sooner rather than later we plan to add a rock or stone surface under the fire pit (safety first!). Our long range plan for our backyard is for trees, trellises, more fencing and lot of plants! It is always fun (and a bit overwhelming) to have a nice blank slate to work with! Even if you don’t have the ideal setting or budget yet for your dream backyard oasis, you can still create a memorable space for backyard fun with your family THIS summer. Baby steps and simple makeovers are A-OK! 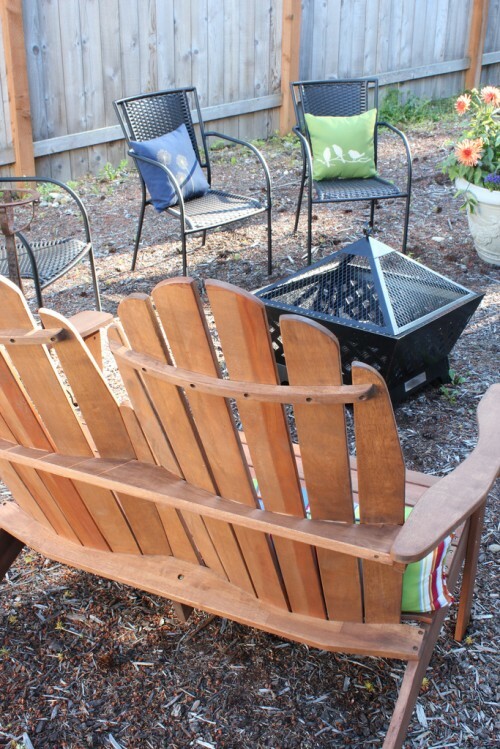 A fire pit, a few potted plants and some new chairs = a backyard makeover our family will remember for a lifetime. Woven chairs, bird & blue pillows, plants and fire pit. More weekend makeovers to come! I’m currently working on a front porch, a deck and a little potting area! Oh, and in case you are wondering (cause I know you all are) I’m still working on our bathroom and a couple of other spaces in my house. Yes, I am making progress on that bathroom, in spite of the lack of blog evidence. I promise. 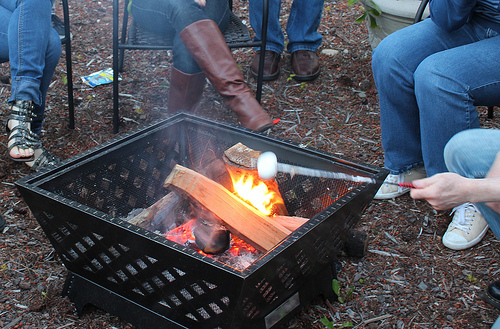 Do you have a fire pit or a special outdoor space for family gatherings? very cute, i can see how having a blank slate would be overwhelming.But it looks like the perfect gathering spot already. Love the bird pillow! 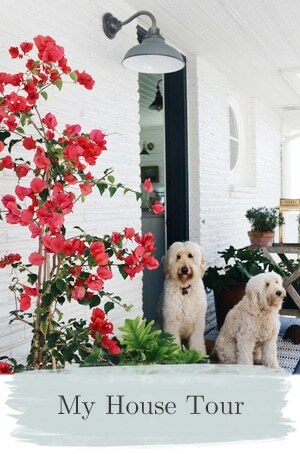 Your week-end back yard make-over is lovely. I like the Adirondack style bench and decorative pillow. 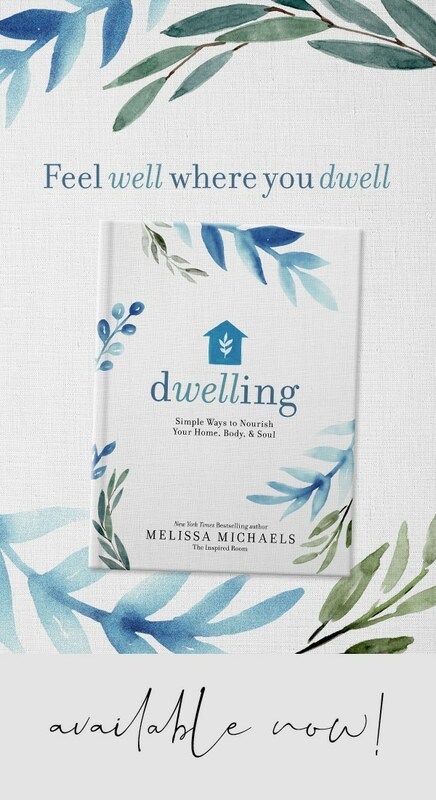 What a great place for friends and family to be less aware of time and more aware of the moment! We don’t have a fire pit but I do have a front porch, slate stone patio, pergola and gardens. This would make a great link party. It’s odd that my last post link wasn’t included above. Great post! So true that you don’t need a crazy budget to turn your outdoor space into your perfect entertaining area! 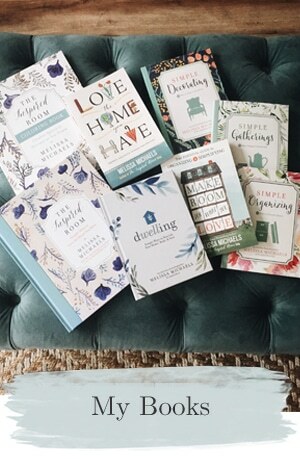 We’ve slowly transformed ours using Goodwill finds & spray paint and we couldn’t be happier with the results! Love being able to work on a space, over time, with creative finds! Can’t wait to watch my space evolve! It’s amazing what you can do with just a few items to make it look so inviting. What stood out the most for me, however, is that everyone is dressed warm…:)! It has been in the 90’s here and we will probably not use our firepit until October! Where did you get that firepit? I absolutely LOVE it! Thanks! It is fun to see how just a few items can transform a space in such a short period of time. Can’t wait to work on it more, I’m sure we will love it this fall too! It is still a bit cool here in the evenings, as you can see but we are having a lovely sunny week! PS. I got the fire pit at Lowe’s! Love the outdoor space! I’m hoping we can have something like that in our backyard some day! LOVE it. 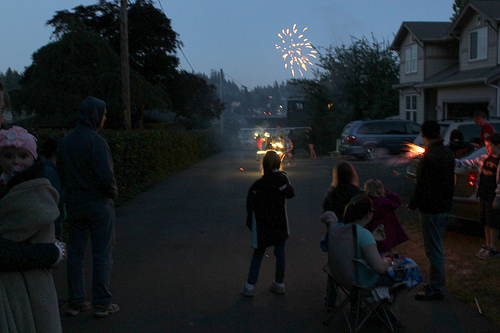 We did the same thing on the fourth – just not at my house. It was a delightful evening. How much do I love those pillows?!?! Too stinkin’ cute! I’ve been feeling a little bit like I totally missed the boat on the yard projects because I didn’t get around to them back at the end April/beginning of May, like everyone else in the world, it seems. Glad to see you’re still going at it, and I plan to, too-gotta make the most of my summer vacation off from school! I love your new space! I’ve been working on my garden area for 8 years! My goal has been to create a cottage garden atmosphere. Living in Utah makes that a bit more challenging! We’ve built a white picket fence, table/benches and a picket fence bench all out of wood that someone was going to throw away! Free is a great price to do projects with! We have great shade provided by an umbrella like fir tree. Hmmm….I’ll have to do a post on this :) Creating a garden/hangout area on a budget can be alot of fun if you let your creativity take over! Yay, Lowe’s! What a nice spot and you guys really need such a place for all the hosting that you do. It looks great and like such fun! HI! 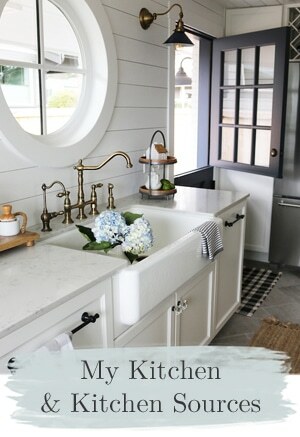 I’m so excited that Kim over at Today’s Creative decided to feature you again today, while she’s away! I missed the last one and didn’t get a chance to “meet” you! I love your firepit area! I have a firepit that I pull into the middle of my yard, while I long to have this little back area all fixed up as a patio for the little guy! Can’t wait to see what you do with that area. You’ve gotten off to a good start though! Great to hear about another NW blogger, I’m over in Beaverton. Sounds like you moved out of the area, but still, nice to see the NW girls and their blogs! Enjoy your week! We love our pit area too! Smor’es are a favorite to make. THe kids got very nice metal Tiki torches for Dad on Father’s day. Slowly being made more beautiful but so enjoyable already! I think I might get my husband a firepit for Christmas – he would love it and you’re right we could start making family outdoor memories. I also bought a firepit from Lowe’s this weekend! It was prefect for making smores! The weather in the UK isn’t really consistently warm enough to justify the expense of a permanent fire pit, unfortunately! We live in a Victorian terraced cottage and have a stone-flagged patio outside our back door before the garden properly starts. thats awesome! i’ve been wanting a fire pit too but had no clue where to put it. Love it that you just “made” a space for it! Love the pillow too! It’s not set up yet like s many other things i’ve purchased on bigbigsale, but I have a camper fireplace, with steel mesh to keep dogsnoots out & a top to keep sparks in if I “retire” b4 it’s totally out–plus a wood handle&wheels to roll it to the concrete drive. Like many cities, there is no “open burning”–but from my police friends, keep a grill set & hotdogs or mooshmallows handy. Then it’s a BBQ. :) AnyWay–i want to get the arbor up&the raised beds planted&the big ol’windows out of daddy’s barn for one greenhouse end with coldboxes&windows for tops. He&I were gonna build one onto the south side of the barn&then his health failed worse than mine. So it’s his honor-greenhouse&arbor. Any leftover windows go to my eldest neph waaay out in the country for an appropriate part-treehouse,part fort for his 3boys, since AuntSuse cant build’em hay forts&mazes in GreatGramps’ barn like did for their daddy. :) Someday…and for all the right reasons. Looks fraught with potential! What fun. Love it! We bought the same fire pit to replace our old rusty one and use it all the time! And how did I miss those ADORABLE pillows at Lowes?! I am outside Seattle and face the same challenges as you do…very small yard and little privacy. It’s so hard but I am trying to make it work. Thank you SO MUCH for all your wonderful inspiration! wow! that bird pillow looks like some i bought on etsy from joop. I can’t believe you got it at lowe’s ! Sometimes it’s good to be reminded it’s the memories created that make the makeovers so fabulous!!! We DO have a firepit on our back patio and we LOVE it! We use it a lot! The kids love it, we love it, and my folks come out and join us too. It’s great for family time. I keep smore makings in the cupboard all the time, and the kids friends join us often. I think it’s one of the best trends ever, and I’m not a trend follower at all. 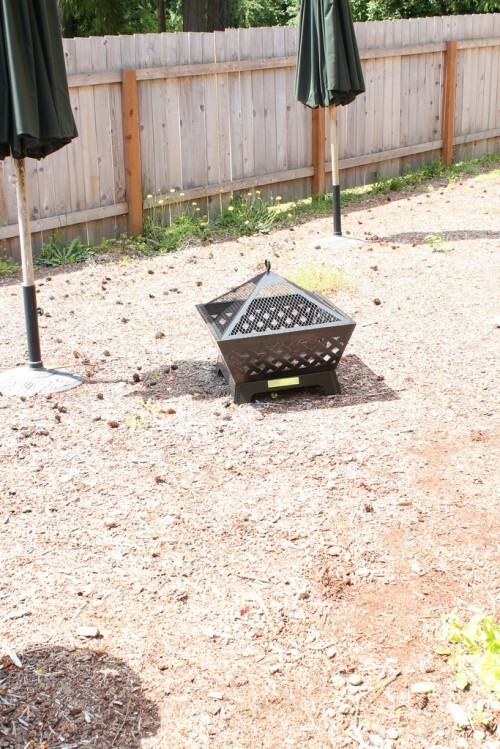 Question about your yard…did you remove all the greens? If so, was it a long process?